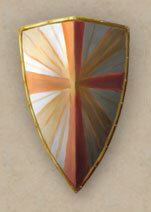 The kite shield is a long, triangular shield with a rounded top. It is too unwieldy and heavy to be used as a weapon, but is very effective for blocking attacks, and automatically absorbs damage as if it were armour. Skill type: Shields (also benefits from the Large Shield Mastery talent). Good styles: Crane, Crab, Swallow, Dragon and Scorpion. The tower shield is a very tall infantry shield, greater in length than breadth, which covers the body from shoulder to knee. It is extremely heavy and useless as a weapon, but is very effective for blocking attacks, and automatically absorbs damage as if it were armour.